The day has finally come where I feel comfortable releasing the first preview build of The Jawa Toolbox. It's still heavy WIP, so be warned. A lot of QoL features aren't in yet, hotkeys aren't rebindable and there is a clear lack of configurability, but this is all planned. Despite the shortcomings and the WIP nature currently, I wanted to release it anyway, else there'd be a continued feature creep and soonTM indefinitely releasing any release of this at all. What is The Jawa Toolbox? The Jawa Toolbox is the first goalpost of a larger project that aims to expand the client functionality, improve visuals and provide client development tools. In this first piece of the puzzle, I took where I first started a long time ago with the MtgClient edit and expanded it quite a lot, offering not just the offline environment to any PreCU SWG client, but also tools to quickly spawn objects and appearances, quickly moving to anywhere in the scene, reloading many of the assets and our very first live, visual World Snapshot editor. Currently, TJT is strictly a development tool. While some functions may be used in an online environment, if you think you can 'hack' in any shape or form with this, look elsewhere, because this tool doesn't provide that functionality, as everything is strictly client side, even when connected to a server. Load into a scene (Offline terrain environment). 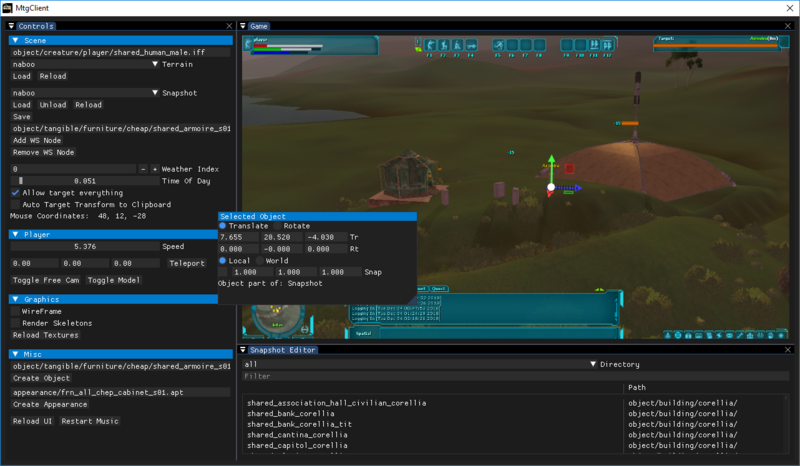 Reload the current terrain (Including its environment datatable, color ramps, textures, etc). Load, unload and reload World Snapshot (snapshot/*.WS) files. Add and remove nodes from the .WS file, including the ability to then save the current .WS file. Changing the weather or time of day on the fly. Ease of movement options such as the ability to change the (offline) player speed or teleport to xyz. Freecam, including the ability to hide the player model (Only works in freecam). WireFrame, including the ability to toggle on the render of skeletons on all things that have a skeleton. Add a non .WS object or appearance for testing and previewing purposes. Reload textures, the UI and restart music. Top level TJT.cfg override inside the injector directory, no need to edit anything else in the game. Crash logs will now be placed into the logs/ directory inside the games directory. Ability to instantly load into an offline scene on startup if 'AutoLoadScene' is set to true inside settings.lua, to change which terrain it loads by default, edit TJT.cfg's 'groundScene' setting. I will post a full planned feature list soon, but feel free to make requests! Simply extract the attached folder anywhere you'd like and run the tjtLauncher.exe, nothing else needs to be done, any of the files or the folder itself do not need to be in any SWG directory. Upon running it for the first time, you will be asked to select your SWG client, after that you'll be good to go. Currently, the only option to run TJT is to use the provided launcher, in the future I might add an injection ability into a current running client but this is still undecided. The only requirement current is to have the latest Visual C++ 2017 Redistribution pack installed. If the ingame UI is turned off and Bloom isn't enabled, the screen goes red, but this can be mitigated by keeping bloom on. The keybind to delete nodes can bug out the ingame controls, usually alt tabbing fixes it, but not always. Grabbing focus when the game is onfocused in the wrong place bugs out the cursor in game, needs to be alt tabbed and tried again. Freecam keybinds aren't the best and can 'stick' or bug out at times making the camera go in a certain direction without input, spamming the opposite directions tends to 'fix' it. Teleporting in freecam doesn't move the camera, toggle freecam to fix. Sometimes input can end up in the games chat window. There are more issues, but these are the obvious ones. Please report any crashes, bugs or issues with as much info as you can provide so I can try my best to fix them as soon as possible! Sytner - For the superior maffs in times of need. Uli - When memory is in doubt, MTGUli is here to help out. Borrie BoBaka, mezzanine, Halyn & algebuckina - My testing troop, couldn't have done it with out them, especially mezzanine. Violet - Who is a princess and is grumpy if she isn't mentioned in the credits for insisting TJT to have a 'Show Skeletons' feature. Everyone at MTG - Who keep me company as I'm pulling my hair out and keeping my spirits up. Everyone else in the scene for keeping SWG alive! Special shoutout to Miztah's long lost Christmas tree that went without a home due to TJT and other things. May you be found in the near future. Downloaded this simply for the Free Cam aspect, which I've been patiently waiting for for literally years. I have to say, it was worth the wait. As a video maker, being able to detach the camera from the player model and fly around freely is a godsend. While there are some minor quality of life things I'd like to see added to it, I would not be disappointed if it were to remain as-is. For SWG video-makers, worth the download alone. A whole new way to handle SWG design. The inclusion of gizmos has been an incredible time saver, as well as a godsend to someone with carpal tunnel from too much copy pasting. This is the closest thing we've had to a real toolset for SWG thus far. From designing areas, to making trailers, to simply just debugging issues, to so much more, TJT is the tool you need.